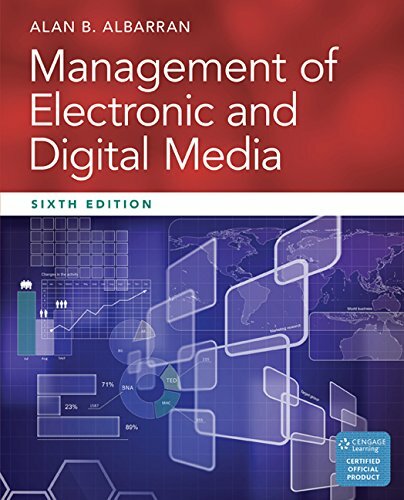 1305077563 -Packed with real-life examples and case studies, MANAGEMENT OF ELECTRONIC AND DIGITAL MEDIA, 6e, provides the latest information on the management and leadership techniques and strategies used in the electronic and digital media industries. The text is popular with professors and students alike for its contemporary approach and clear, current illustrations. Succinctly written, the Sixth Edition covers the most important aspects for future managers, leaders, and entrepreneurs in the rapidly evolving media industries — and includes an all-new chapter: “Media Management: Manager/Leader/Entrepreneur”. Social media is integrated throughout. New coverage highlights trends in big data, mobile, social media, and the cloud. In addition, end-of-chapter case studies put the student in the role of a manager in a decision-making environment.